When it comes to gut-wrenching, wheelie-popping monster torque, nothing comes close to Traxxas Traxxas Traxxas Traxxas E-Maxx. Twin Titan 550 motors, trick 14.4V ESC power system, 3-channel radio, and shift on the fly 2-speed transmission all put the Traxxas Traxxas Traxxas Traxxas E-Maxx in a class by itself. 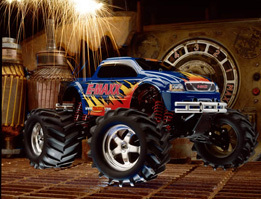 If you want the best, most innovative monster truck there is, look no further. 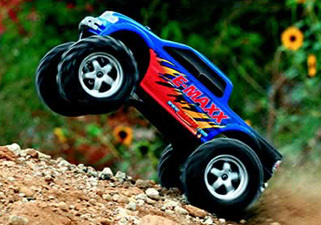 Traxxas Traxxas Traxxas Traxxas E-Maxx breaks the rules and beats them all! Big Block Motors: Twin Titan fan-cooled 550 motors have 30% longer armatures than a standard 540 size motor for monster torque. Dual Motor Drive System: The dual motors drive a completely sealed 2-speed gearbox. An adjustable slipper clutch system provides drive train protection and traction control. More Power: The all new MOSFET VX-12 forward-reverse electronic speed control delivers a whopping 14.4+ volts to the motors from dual 6-cell battery packs*. That’s twice the power of ordinary RC models! Plus it’s backed by our limited lifetime electronics warranty. High-Voltage Power System: Traxxas new 12-cell high-voltage power system combines the specially-wound 550 motors and the efficient electronic speed control for increased power, substantially reduced current draw, and long run times. Two Speed Transmission: Shift on the fly from your transmitter! Select low gear for brutal acceleration and then use the grip-mounted shifter on the transmitter to grab high gear and insane top speed. Proportional reverse in high or low is supplied by the electronic speed control. Incredible suspension: The awesome T-Maxx suspension delivers 4 inches of maximum ground clearance and over 3.5 inches of super plush suspension travel with eight oil-filled shocks. Efficient Shaft Drive 4WD: Power is transferred to all four wheels efficiently with the proven shaft drive system from the T-Maxx. 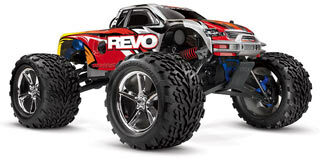 Semi-Tub Molded Chassis: The Traxxas Traxxas Traxxas Traxxas E-Maxx features a new, extra tough, molded composite chassis with battery cutouts that lower the center of gravity when using side-by-side racing-style battery packs. The battery holders accept both stick packs and side-by-side race packs. 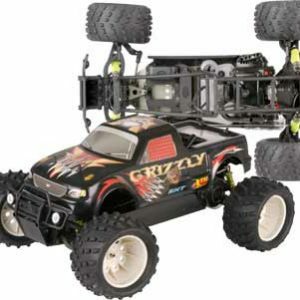 New Painted ProGraphix Body: The Traxxas Traxxas Traxxas Traxxas E-Maxx will include its own newly designed crew cab truck body. This new body features many molded-in details and is designed to fit over the chassis like a glove. The truck will also arrive with one of our patent pending ProGraphix 6-color custom painted bodies and will also be professionally trimmed for quick and easy installation. Ball Bearings: The entire drive train and wheels spin on 28 sealed ball bearings. 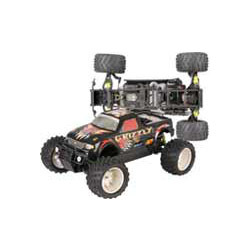 High Torque Steering Servo: The included Traxxas 2055 high torque steering servo provides a whopping 80 oz./in. of torque to turn the truck’s big tires with ease. 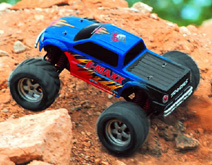 Parts Compatibility: Traxxas E-Maxx utilizes the suspension and drivetrain from the T-Maxx so most replacement parts and optional accessories are already in hobby shop inventories. 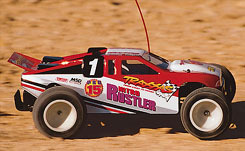 Ready-To-Run (RTR): The Traxxas Traxxas Traxxas Traxxas E-Maxx will be sold RTR with a Traxxas 3-channel TQ-3 radio system and a painted ProGraphix body installed on the chassis.